You know you’ve hit a cultural moment when a line of sneakers is designed to look like a trendy piece of food. Well, we’re there, and we’re talking about these new “Avocado Toast” sneakers. 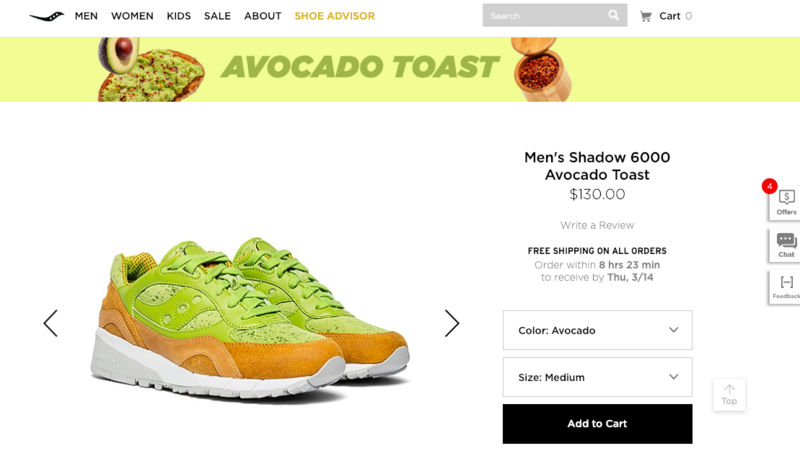 They’re actually called, “Men’s Shadow 6000 Avocado Toast” and are selling for $130 by Saucony. Now people are reacting, like this guy, who kinda likes them tbh. And others are questioning the whole idea. I mean, could it be any more millennial? And then, of course, others are scoffing at the high retail price. P.S. Saucony is also the company responsible for selling these “Pumpkin Spice” sneakers, remember? Looks like they’re already catching on. LOL!